Eurostar has announced its new high-speed service to London will open in a year's time. Good news for European travellers, but when international trains stop arriving at and leaving from Waterloo, what will happen to the station's award-winning international terminal? 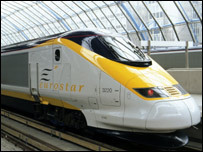 Eurostar's 186mph trains will start using the Channel Tunnel Rail link, from Ebbsfleet, in north Kent, to St Pancras International Station, on 14 November 2007. The International Terminal at Waterloo was feted as airline standard service for train travellers, but now there is a question mark over its future with the shift to St Pancras. Other than vague plans for commuter services, it is unclear what will happen next. 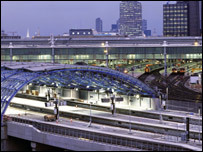 The Department of Transport, which will regain control of the platforms when the transition takes place in November 2007, has committed to providing domestic services from the former Eurostar terminals. But the station's sweeping platforms, opened only 12 years ago, and geometric glass roof were designed specifically to accommodate Eurostar trains and intercontinental passengers. "What's started now is a large piece of work to explore what is needed to convert the platforms to domestic trains," a government spokeswoman said. But the extent of that work, how much it will cost, and how long it will take, is far from certain. "Basically, nothing's in and nothing's out at the moment," she said. "We want to make best use of this important asset. "The changes that bring the most benefit to the most passengers are the ones we'll look at," she said. The extra track and platform space is badly needed to alleviate congestion at a station that picks up and puts down more than 100 million passengers each year. According to a Eurostar spokeswoman, there was "huge potential" for the platforms to alleviate some of the pressure, but only with extra work. London Travel Watch, the commuter advocacy group, welcomed plans to open up more space for commuters. "Waterloo is very, very overcrowded, capacity is a huge issue there," said a spokeswoman. The issue is obvious for "anyone who has been in and out of Waterloo and has crawled between Waterloo and Vauxhall," she added. There have been hints that the new services may be provided by South Western Trains, which currently run services from Waterloo to the south of England. But as yet, "there is no agreement with the Department of Transport about the International Terminal", a South Western Trains spokeswoman said. "The future of what happens to the terminal is a question for them." In any case, she said, without major changes to the station's infrastructure, only the company's Windsor trains are currently able to access the former Eurostar platforms. Whatever the eventual alterations to the platforms, the station's striking modernist design will remain untouched. "The award-winning roof will stay as a national legacy," she said. And this was by no means always certain. "At one time we were very concerned that it would be turned into luxury flats/retail," said a London Travel Watch spokeswoman. "We are very pleased that it will be used for the trains which it was built for," she said.